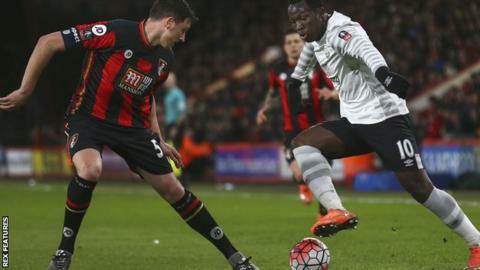 Bournemouth captain Tommy Elphick says their FA Cup exit will allow them to focus on Premier League survival. The defender, 28, completed 90 minutes for the first time since September in the 2-0 defeat by Everton on Saturday. "It's a disappointing result," he told BBC Radio Solent. "But we've said in the dressing room that we've got to give it our all for the league now." Bournemouth, four points above the Premier League relegation zone, travel to Watford on Saturday. "There's some real key fixtures coming up," he added. "Some players put in some performances tonight (against Everton) that put themselves in the manager's head. "The silver lining from this game is that we can now give it everything in the league. There's players in the squad who are now fit again and that are in a good place, ready to all push in the same direction." Elphick missed four months of this season following an operation on his ankle, and returned to action in the FA Cup fourth-round tie at Portsmouth.